ghosts.nin.com was created in March 2008 to coincide with the release of Halo 26, Ghosts I–IV. The site contains information, an FAQ, a downloadable PDF and options for ordering the album. It also includes a signup page to get a free download of the first volume of the album. 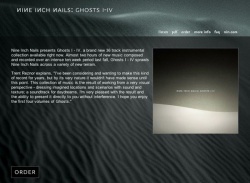 "Nine Inch Nails presents Ghosts I–IV, a brand new 36 track instrumental collection available right now. Almost two hours of new music composed and recorded over an intense ten week period last fall, Ghosts I–IV sprawls Nine Inch Nails across a variety of new terrain. "This music arrived unexpectedly as the result of an experiment. The rules were as follows: 10 weeks, no clear agenda, no overthinking, everything driven by impulse. Whatever happens during that time gets released as... something. - Trent Reznor, March 2, 2008"
This page was last modified on 3 November 2018, at 20:45. This page has been accessed 14,162 times.